I don’t have the normal FUGE story like most people. I didn’t grow up going to FUGE. I wasn’t that 7th grader who immediately knew on day one of camp that I would one day be a FUGE staffer. I actually never had the chance to attend FUGE Camps as a camper. I was familiar with FUGE Camps, but I had no experience. Before coming on staff, I had even made the comment that working camp was not for me and something I would never do. Little did I know, the Lord had a plan to bring FUGE into my life to bring me closer to Him and change my life in so many ways. My FUGE story started in 2015. I had plans to serve in Africa that summer, but when those plans fell through, I decided to pray through all of the options of ways I could serve. 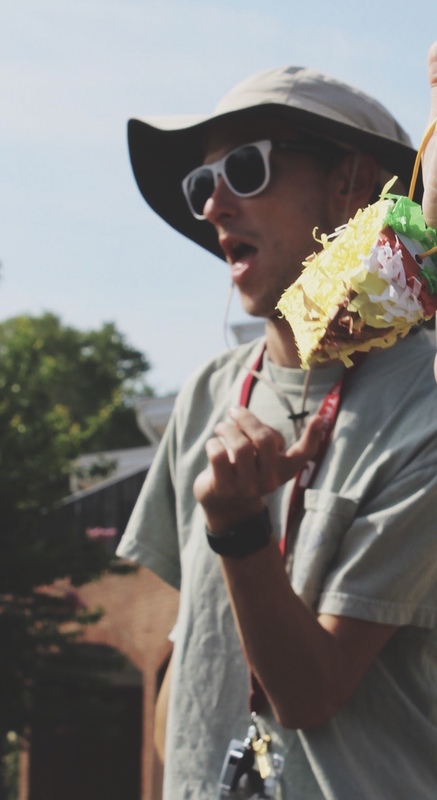 I had a friend who had worked for FUGE Camps so I decided to apply and see what happened. I went into my interview trusting the Lord and understanding that either God had a plan for me to work camp, or I wouldn’t get hired, meaning He had something else for me. In December, I received an email from the FUGE office saying I had been hired onto the North Greenville team as an MFuge Swing Ministry Track Leader. Honestly, I didn’t know what that meant, but I did know that the Lord was up to something. Entering into that first summer, I honestly knew nothing about camp. I asked my Site Director 500 questions about being a staffer because I had no experience with FUGE and didn’t know what I was doing. That summer, I had to trust the Lord and lean on Him each day. I had never been so exhausted in my life, but I daily found strength in the Lord to lead and serve. I learned what it meant to love and serve even when I didn’t want to because that’s what Jesus did and calls us to do. I also began to gain a community of other believers who have become my closest friends. I thought that I would work one summer and be done, but again, God had other plans. I came back in 2016 for a second summer. I was a Swing MTL again and also served as Missions Mobilizer. It was an incredible summer of being able to encourage and empower students to follow the Lord’s leading toward missions in their lives. In 2017, I had the chance to serve as the Site Director at North Greenville. Being a Site Director is one of the most challenging things that I have ever done. Coordinating eight weeks of students and adults serving in a local context was both incredible and exhausting. I learned how to really depend on the Lord, and I watched Him provide time and time again. There were so many times that a site would fall through or something would happen on site, and the Lord showed up every single time. I saw the Lord’s faithfulness in a way I never had before. In Psalm 37, the writer says that God never leaves His children begging for bread, and I saw that Scripture come to life. There was not a day that went by that I did not see the Lord move. I had the chance to lead 16 incredible MFuge staffers and watch them grow and flourish into the leaders God had called them to be. For the last year, I’ve had the opportunity to serve as a Program Specialist in the FUGE office. I’ve gotten to see behind the curtain of the FUGE world. I’ve had the chance to help prepare for this upcoming summer by helping with PLANNING for MFuge and Access International. I’ve learned the importance of administrative work in the Kingdom of God, and my love for serving the Church has deepened. Each summer that I have served and my year in the FUGE office has changed my life in one way or another. If you had told me in 2015 that I would work for more than one summer and even have a year in the FUGE office, I would have thought you were crazy. The experiences I have had because of FUGE have shaped my life and deepened my walk with the Lord. Because of FUGE Camps, I have fallen more in love with Jesus. I have seen His grace, love, and mercy exhibited in new ways. I have been transformed from someone who was timid, shy, and not outgoing to someone who is confident in who the Lord has created me to be. I have found the giftings, talents, and passions that the Lord has given me because of working for FUGE. I have found the best friends and community I could ever ask for because of FUGE. I’ve gotten to see countless students and adults meet Jesus either for the first time or in a totally new way. My walk with Jesus is truly different because FUGE puts Jesus at the center of everything and really does offer “life-changing camp”. I am thankful for the way the Lord uses FUGE to impact the lives of thousands of students, adults, and staffers. All glory goes to God. Happy 40th summer FUGE, and here’s to 40 more years of life-change!